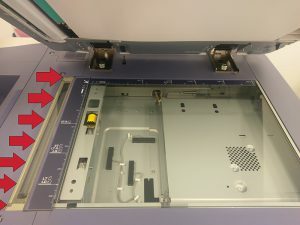 If you have noticed that when making a copy through your document feeder, your copies have an unwanted line running down the page, we have a simple fix for that! This issue is caused by dust or dirt on the glass or scanning surfaces. To remedy this issue, all you need to do is take a soft cloth and wipe off the glass surfaces. After wiping down these surfaces down, try making another copy and if the line goes away, your problem is fixed!